Based in Taroudant, an ancient walled market town little visited by tourists and with shopper-friendly souks to which you may be introduced by one of our staff. Enjoys the best winter climate in Morocco due to its southerly setting in the fertile Souss Valley, the source of an abundance of fruit and vegetables, it lies between contrasting mountain landscapes: the majestic High Atlas and the extraordinary Anti-Atlas (bordering the Sahara). Inexpensive flights if booked early. The holiday starts and ends on a Tuesday to take advantage of cheaper flights (usually c £90 return). £540 for: accommodation for 7 nights in twin/double rooms (singles may be possible for a £120 supplement); substantial breakfasts; vegetarian evening meals (option of meat or fish for small supplement; special diets catered for) For those who wish to return: 2 new excursions; 2 cultural experiences (chosen from several); “A Feast for the Senses” celebration; a minimum of 2 hours singing daily (there will be chances for spontaneous singing as well) and transfers to and from Agadir airport. 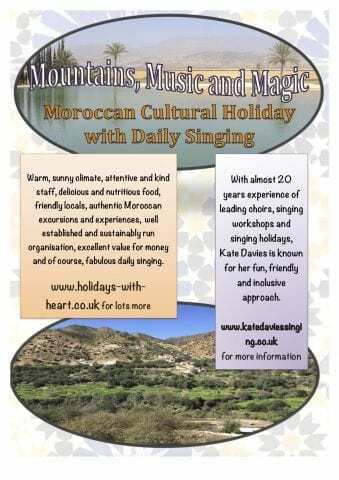 To reserve your place or make enquiries about the holiday, go to www.cecu.co.uk/bookings We will then confirm availability of room(s) and supply you with the payment schedule, which is split into 3 parts to make it easier to budget. It’s essential to book early in order that we can give you the go-ahead to book flights as soon as they’re published (likely to be Easyjet Gatwick to Agadir, just 50 mins drive from us), and thus save money. Early booking ensures you get a place on these extremely popular holidays as well as a cheap flight!